a load of sand or cement or even a whole wall. 32 monks are living there, who can bless you anytime and put a wristband. This temple has the bells tradition. The trees are covered with bells, each with a little wish written on a metal leaf that blows in the wind. The breeze rings the bell and makes the wish. You can buy a bell, making a donation to the temple, and add your wish to the trees around the Buddha too, for as little as 250 baht. 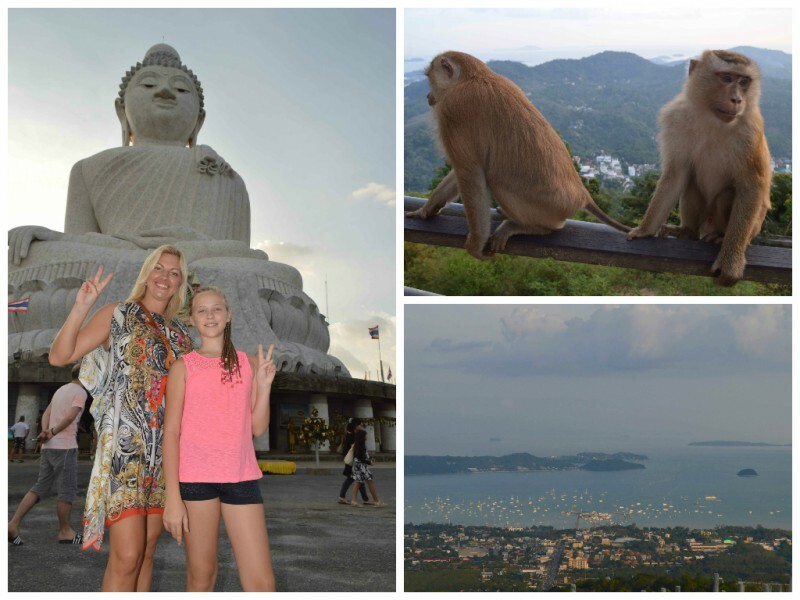 Phuket's Big Buddha is one of the island's most important and revered landmarks on the island. The huge image sits on top of the Nakkerd Hills between Chalong and Kata and, at 45 metres tall, it is easily seen from far away. The lofty site offers the best 360-degree views of the island, with sweeping vistas of Phuket Town, Kata, Karon beaches, Chalong Bay and more.) Easily reachable via a six-kilometre road leading from Phuket's main artery route, it is a must-visit island destination. Close up to the image itself, it is very peaceful and the only noises you will hear are the tinkling of small bells and the yellow Buddhist flags in the compound flapping in the wind, with soft background dharma music. Known among Thais as the Phra Puttamingmongkol Akenakkiri Buddha in full, it is 25 meters across at the base. The whole body is constructed with reinforced concrete layered with beautiful Burmese white jade marble that shines in the sun, making it a natural symbol of hope. The views, and the actual image itself are breathtaking. There is a smaller Buddha statue positioned nearby which is gold in colour, though actually made of brass. Donation Boxes Near the base of the Big Buddha, there is a hall displaying the project's history, some Buddhist teachings and countless donation boxes. For some visitors, the donation boxes, with their incessant requests for cash, can be a real eyesore and a bit of a disappointment to see in such a holy place. But whether visitors like it or not, the whole project relies on public donations. As one of the most popular attractions in Phuket, with road signs pointing the way to it right across the island, it certainly gets plenty of them. This does also mean that it is one of the busiest attractions, with big crowds being quite common. Practical Information What to Wear Avoid beachwear, short skirts and T-shirts with offensive texts or images. If you feel you have dressed a little too daringly for a religious site, you can always ask for a sarong to cover up with. It is free of charge from the site centre. Did You Know a) Nakkerd Sea View Restaurant is located near the Big Buddha and is a nice place to chill out after visiting the site. The food there is reasonable in terms of taste and price and the view, of course, is wonderful. b) The road to Nakkerd Hills is in good condition, most parts are newly built but it has many curves and some steep climbs. Some young tourists enjoy hiking up, even though it usually takes them over an hour to reach the top. Big Buddha Opening Hours: From 08:00 – 19:30. If you want to catch the sunset from one of Thailand's best spots, try to be there before 18:30 How to get there: The road leading up to the Big Buddha is off Chao Fa Road East near Chalong. There are many red-and-white signs indicating where it is. Turn down Soi Yodsane and simply follow the indications for the next six kilometres up the hill. You can’t miss it. Phuket Big Buddha พระพุทธมิ่งมงคลเอกนาคาคีรี (Phra Phutta Ming Mongkol Akenakiri or Ming Mongkol Buddha), is on the peak of mount Nagakerd, Subdistrict Karon. Big Buddha Statue width: 25.45 m. height: 45 m. Reinforced concrete structure adorned with white Burmese jade marble. The weight of the white jade marble is approximately 135 tons per 2,500 sq.m. You can even purchase a break or marble tile and sign your names to be places forever inside the Big Buddha. The name “Phraphutthamingmongkhol-akenagakhiri” was later granted and appointed as the Buddha statue a treasure of Muang Phuket by Somdech Phra Yanasangvara, The Supreme Patriarch of Thailand on August 19, 2008. This was accepted with reverence by Mr.Suporn Wanichakul, the president of the corporation creating the Buddha statue. Annika Urm LIVE on iTalk Fm every Thursday!